Hazel Grace Lancaster is a seventeen-year-old living with cancer. At the request of her mother, who believes she is depressed, Hazel attends a cancer support group in the basement of a church. Hazel does not like the support group, but goes to make her mother happy. One day upon arriving at the support group, however, Hazel is delighted to see a handsome new boy in attendance. During the discussion, the attendees introduce themselves, and Hazel learns the boy’s name is Augustus Waters. Augustus has lost one of his legs to a form of cancer called osteosarcoma, but his cancer is now in remission. He is there to support his friend, Isaac who has lost an eye to a rare form of eye cancer and now must get the other eye removed. After the meeting, August approaches Hazel and tells her she looks like Natalie Portman from V for Vendetta. Hazel does not believe him because she carries an oxygen tank and her cancer treatment has made her cheeks red and puffy, but they continue to flirt. Augustus asks her to come over to his house to watch the movie with him. Hazel agrees and after arriving at Augustus’ house, he introduces her to his parents. Their house is loaded with sayings embroidered on different objects. While hanging out, Hazel tells Augustus that she has thyroid cancer that has spread to her lungs, but she has been spared some time through a cutting edge treatment that has not been effective with many other people. Before leaving, Hazel tells him about a book she is obsessed with called An Imperial Affliction. She tells that the novel is about a young girl with cancer. She loves the book because of its honesty regarding the realities of dying. The novel ends midsentence, which Hazel thinks is genius, as it portrays the realities of death. She tells Augustus about her desire to contact the novels author, Peter Van Houten, to find out what happens after the book ends. Augustus agrees to read An Imperial Affliction if Hazel will read his favorite book The Price of Dawn. Hazel tells Augustus they can talk again after she has finished The Price of Dawn. After reading, The Price of Dawn, which is particularly violent, but somehow enjoyable, Hazel calls Augustus. He is consoling Isaac who was recently dumped by his girlfriend, Monica. Hazel visits and watches them play video games until Isaac suddenly breaks down and begins punching pillows. Eventually, Augustus tells him to break his basketball trophies. After Hazel leaves, she does not talk to Augustus for a week. When Augustus finally calls, they discuss An Imperial Affliction, and Augustus nonchalantly says that he has contacted Van Houten through his assistant, Lidewij Vliegenthart. Hazel cannot believe he was able to contact the reclusive author. Augustus shares their conversation and tells Hazel his email address. Hazel begins developing a list of questions to ask Van Houten, mostly dealing with the novel's sudden ending. She desperately wants to know what happens to the main character’s family after she dies, as she believes it will provide some insight unto what will happen to her own family after she dies. A few days after sending her email to Van Houten, he replies telling her that he can only answer her questions in person. His reply saddens Hazel, as she thinks she will never be able to make it to Amsterdam where Van Houten lives. Shortly after hearing from Van Houten, Augustus invites Hazel to join him for a picnic. As they venture out into the park and take a seat before a giant skeleton sculpture, Hazel begins to realize the picnic is strangely Dutch-themed, including the presence of the statue, which was created by a Dutch artist. During the picnic, August reveals that he wants to use his “wish”, a gift from the “Genie Foundation” (comparable to the Make a Wish Foundation), to take Hazel to Amsterdam. Hazel is ecstatic to hear this, but when Augustus reaches out to touch her face, she pulls away. She reveals that she is afraid to get close to people because she feels like a grenade—that her death will harm everyone close to her. As Hazel contemplates what to do with Augustus’ offer, she grows ill and is forced to go to the hospital. She ends up in the ICU for a few days. She later learns that Augustus stayed in the hospital the whole time; even though she would not let him in the room for fear he would see her in such a state. After Augustus shows her another letter from Van Houten, Hazel becomes determined to go to Amsterdam. Unfortunately, Hazel’s parents and the team of doctors who care for her determine she is not able to travel such a long distance. Eventually, however, her favorite doctor, Dr. Maria, convinces her parents to let her go. Augustus, Hazel, and Hazel’s mother, Mrs. Lancaster, fly to Amsterdam. After checking into their hotel, Hazel learns that Lidewij has made a reservation for Augustus and her at a fancy restaurant called Oranjee. During dinner, they talk about life and death and Augustus shares that he fears he will die without having done anything extraordinary. Hazel is offended by the idea that only extraordinary lives are meaningful. Augustus then tells Hazel about his ex-girlfriend who died of cancer. He laments the fact that people idealize kids who die of cancer, and explains that his ex’s personality changed due to her brain cancer, making her progressively more vicious toward Augustus until she died. The next day they visit Van Houten. Hazel is elated to finally get the answers she has been waiting for about the end of An Imperial Affliction. Her dreams are shattered, however, after they find out that Van Houten is a miserable, mean spirited alcoholic. He claims he cannot give Hazel the answers she seeks, and rants about his nihilistic views of life and death. Eventually he insults Hazel, telling her she is dependent upon pity and that she, as a cancer survivor, is a side effect of evolution. Hazel slaps a glass of scotch out of Van Houten’s hand and leaves with Augustus. Lidewij accompanies them out, feeling sorry for the way Van Houten acted. Together, they visit the Anne Frank house. In the attic space of the Anne Frank house, August and Hazel kiss, and to Hazel’s surprise the other visitors applaud the young couple. After leaving the Ann Frank house, they head back to the hotel. In Augustus’ hotel room, Hazel tells Augustus that she loves him and they make love. The next day, Augustus confesses to Hazel that his cancer has returned and has spread throughout his body. Upon returning to the United States, Augustus’ condition continues to worsen. Hazel watches as Augustus changes from a confident, humorous, beautiful young man to a vulnerable, frightened, and decimated shell of his former self. Despite his condition, Hazel continues to love him, and begins calling him Gus instead of Augustus, as his parents do. Through the process of Augustus’ decline, Hazel realizes that Augustus has become the grenade she feared she would be. In the final days before his passing, Augustus arranges a pre-funeral in the church basement where they met. Isaac and Hazel attend, and both deliver eulogies for Augustus. Hazel uses a line from An Imperial Affliction, which states that there are infinite numbers between zero and one, and an even larger infinity between zero and two. She follows this thought by stating that she is grateful for each little infinity she was able to spend with Augustus. After the funeral, Van Houten asks Hazel and her parents for a ride. He explains that Augustus stayed in contact with him, and that he demanded Van Houten make up for ruining their trip. He attempts to reveal the fate of Anna’s mother, but Hazel is uninterested—she has her answers to what happens after death, as she is living through it with Augustus’ passing. A few days after the funeral, Hazel finds out from Isaac that Augustus was writing a sequel to An Imperial Affliction for her. As Hazel attempts to go to Augustus’ house to find the writing, Van Houten, who is sitting in the back seat of the car, once again startles her. He claims he wants to apologize, and tell Hazel she reminds him of his daughter, Anna, who died of cancer when she was eight. Hazel tells Van Houten to get sober and continue writing. Eventually, Hazel finds out that Augustus had torn the written pages out of his notebook and mailed them to Van Houten so he could use them to compose a eulogy about Hazel. Van Houten sends the pages back to Hazel. The novel concludes with Augustus’ words. Hazel reads the letter, which states that getting hurt is inevitable, but we have a choice in who we allow to hurt us. His letter concludes by stating that he was happy with his choice, and he hopes Hazel likes her choice too. In the final line of the story, Hazel says she does. Powers, Jacob. "The Fault in Our Stars Plot Summary." LitCharts. LitCharts LLC, 16 Apr 2014. Web. 25 Apr 2019. Powers, Jacob. "The Fault in Our Stars Plot Summary." LitCharts LLC, April 16, 2014. 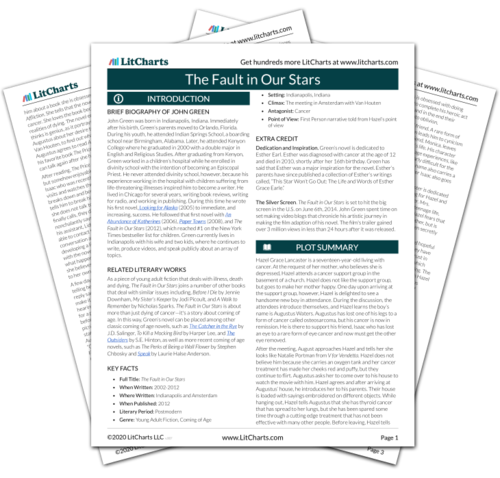 Retrieved April 25, 2019. https://www.litcharts.com/lit/the-fault-in-our-stars/summary.